We welcome the Berne Symphony Orchestra to Bradford for the first time. 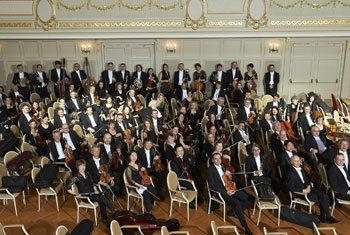 They are regarded by many as Switzerland’s leading orchestra. Their debut performance at St George’s Hall concludes Bradford’s 2014-2015 Orchestral season. The concert is conducted by the Berne Symphony Orchestra’s Music Director Mario Venzago. His distinguished career has included engagements with the Berlin Philharmonic Orchestra, the Leipzig Gewandhaus Orchestra, the orchestras of Philadelphia and Boston, the London Philharmonic Orchestra as well as many other prestigious orchestras. The orchestra will perform Brahms’ most lyrical symphony, his Symphony No. 2, and the first half of the concert will be given over to two Beethoven masterpieces – his dramatic Egmont Overture and his youthful, exuberant Piano Concerto No. 2. The soloist for Beethoven’s Piano Concerto No. 2 is Oliver Schnyder described as “A Musical Sensation” (Süddeutsche Zeitung), “Schnyder belongs to the best pianists of his generation” (FACTS). Details on the new 2015-16 Orchestral Season will be announced soon. Please keep checking the website for information.